Is IV Sedation Dentistry Right For You? It is not easy for every patient to sit in the dental chair and undergo treatment without anxiety or fear. In fact, dental phobia is a very common condition, and one that keeps many individuals from getting the care their smile needs. Sedation dentistry is a way to combat this obstacle. Most modern dental offices offer oral sedation (a sedative pill taken before your appointment) and nitrous oxide sedation (“laughing gas” inhaled through a small mask). However, only an elite group of dentists are qualified to offer an additional level of sedation: IV Sedation. At Mitzi Morris, we now have a dentist who is licensed to perform IV sedation. 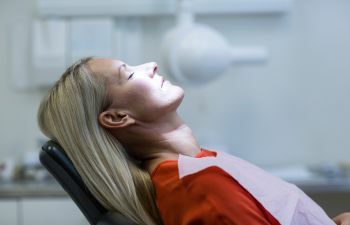 This method of sedation gives patients the highest level of relaxation and is especially valued by patients who have more severe dental anxiety or those requiring lengthy, extensive dental work. Just as it name implies, a sedative solution is administered intravenously. It is important to realize that this is not the same as when you are put to sleep under general anesthesia before a surgery. In fact, most patients sit back and close their eyes, but they are not asleep during the procedure. They can still interact with the dentist although they are relaxed enough that are not completely aware of the sights, smells and sounds of the dental office. The level of IV sedation can be controlled and adjusted quickly at any time during the procedure. While you remain comfortable, your dentist can perform high quality dental care in less time – whether you are having a root canal, multiple tooth extractions or a full smile makeover with cosmetic dentistry. What Is IV Sedation Recovery Like? IV sedation delivers a fast onset of sedation, and its effects wear off fairly quickly. However, you will need someone to drive you home after your appointment. You will also be encouraged to rest and drink plenty of fluids the rest of the day. There are several reports that say patients who had IV sedation experience reduced pain levels the day after treatment. This is likely due to the fact that less force is used during the treatment when a patient is less tense. Most patients remember little if anything about their dental procedure the following day. If you have a sensitive gag reflux, severe dental phobia or can’t sit still for a long dental appointment, ask us about IV Sedation. Dr. Sieweke is an experienced IV Sedation Dentist who can provide the highest level of care.